A true kitchen workhorse, this doesn’t have a lot of fancy frills, but it will get the job done easily. This has two large paddle buttons, one for “on” and one for “off/pulse,” and that’s all you need for the machine to perform all of its functions. This has a 14-cup work bowl that’s large enough for family cooking and an extra-large feed tube so you won’t need to cut foods like potatoes to make them fit. It has small and large pushers, so you can process the potato in one piece, or stand carrots up so they won’t fall over while you slice or shred. This includes one shredding disc, one slicing disc, and a removable disc stem that fits both of them, along with a metal blade for chopping, mixing, blending, kneading, and emulsifying. If you want a little color in your kitchen, this comes in a variety of colors to match your kitchen or your mood. This budget food processor will fit your budget and your kitchen. It’s not the largest processor you’ll find, but the 10-cup bowl is large enough for prepping family dinners and it’s easy to empty if you need to shred multiple batches for your famous cole slaw. This food processor has two speeds plus a pulse option, so your salsa will be as smooth or chunky as you like it, while the bowl scraper can be used while the processor is running or off, so you clean the sides of the bowl without needing to remove the lid. This includes a reversible shredding/slicing disk and a stainless steel blade for chopping, blending, pureeing, and more. When you’re done prepping dinner, the work bowl, lid, and blades are all dishwasher safe, so cleanup is easy. This classic food processor is almost retro. A single paddle controls on, off, and pulse functions, for no-fuss operations. While this isn’t a huge processor with a 7-cup bowl, it still has all the functions of its larger cousins, including the ability to knead bread dough. This includes a medium slicing disc, a shredding disc, and a stainless steel chopping blade for processing everything from cheese to mayonnaise, and it includes a flat cover that you can use when you’re processing in the bowl and you don’t need to add food during processing. This has small and large pushers and a large feed tube, so your carrots and celery for soup can stand upright, but you can still process larger foods without cutting them into small pieces. For easy cleaning when cooking is done, all of the removable parts are dishwasher safe. Most food processors top out at 14 cups, but this 16-cup Magimix (made in France by Robot Coupe) can handle just about anything you throw at it. Not only is it large, but it includes accessories that you won’t find with other food processors. This comes with three bowls, so you can work with small or large amounts of food, and use one after the other. When you’re done, they nest inside the machine, so you don’t need to find space to store them. This has just three buttons for easy operation, one for stop, one for auto, which keeps in on, and one button for pulsing. The induction motor adjusts the amount of power used, so it can power through dense materials with ease. The wide feed tube accommodates large foods, while three-stage pusher can handle slim, medium, or large food without them tipping over or cutting unevenly. The chopping blades (to fit separate bowls) are made by Sabatier, so they are knife-quality. The proprietary Blendermix insert moves the food around in the bowl so it blends more smoothly and results in a creamy texture, like a blender. The special dough blade mixes and kneads dough, including dense bread dough. The whisk can whip cream or beat egg whites, just like a stand mixer. This also includes 2mm and 4mm slicing disks and 2mm and 4mm grating disks, as well as a citrus juicer. A special spatula is included for easy cleaning, and the storage case can hold all of the blades and accessories. The free Magimix app includes hundreds of recipes, so you’ll get the most out of the machine. When space is at a premium but you want to make kitchen prep work easier, this food processor is the perfect fit. The 10-cup bowl can handle average recipes, or you can empty it when needed. There’s just one simple toggle switch to choose on, off, or pulse, so it’s easy to operate. This includes one reversible slicing and shredding disc and a metal chopping blade, so you won’t have a lot of extras to store. When you’re done using it, the lid can be flipped upside down so the feed tube is inside the bowl, and the cord wraps neatly so it won’t get in the way. 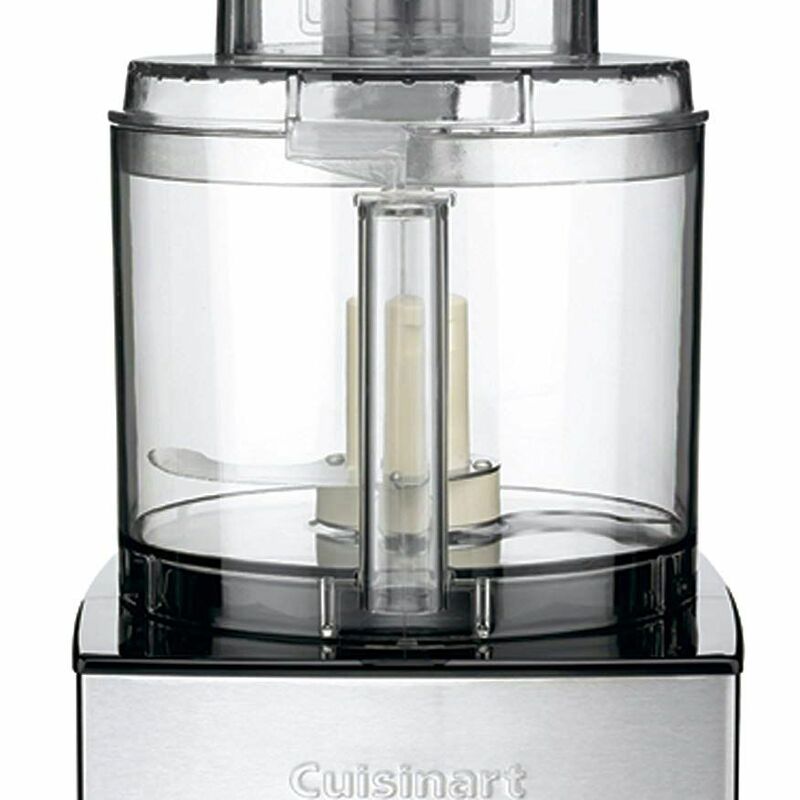 Not too big, and not too small, the 11-cup Elemental from Cuisinart has the heart of a large food processor in a mid-sized body. This has a patented sealing technology that keeps fine powders from dusting out of the bowl and keeps liquids from leaking while the blade also locks into place for safety. The four buttons have a rubberized cover, so they easy to wipe clean—no knobs or nooks that can collect food. Choose high, low, off, or pulse, so you can make your salsa as smooth or as chunky as you like. This includes an adjustable slicing disk, so you can choose the proper slicing thickness, a reversible shredding dish for medium and fine shredding, and a stainless steel blade for chopping, blending, and emulsifying. This small and simple food processor is just what you need for whipping up a batch of salsa, blending salad dressings, chopping nuts for a garnish, or pureeing some vegetables. It has a 3 1/2 cup processor bowl with a locking blade that won’t fall out of the bowl when you empty it. The spout makes pouring less messy when you’ve got liquids to serve. This has two speeds plus a pulse option, so you’ll always get the results you want. The proprietary drizzle basin on the lid lets you add oil slowly to make emulsified dressings with ease. The bowl, lid, and blade are dishwasher safe, so it’s easy to clean when you’re done cooking and the cord wraps around for storage. This two-in-one appliance is both a food processor and a blender. Just switch from blender jar to food processor bowl, and back again. It also includes a smoothie cup, making it even more versatile. You can choose from seven speeds, along with one-touch operation for salsas, smoothies, and milkshakes, and it includes a pulse function for precise control when you’re making chunky salsas or chopping nuts. The blender jar is made from glass and holds 6 cups while the food processor bowl is 5 cups. The food processor includes a reversible slicing and shredding blade as well as a chopping blade. No electricity needed, this food processor works with the simple pull of a handle. The two blades spin in opposite directions, so they’ll spend their time chopping rather than moving food in a circle, while stationary arms at the top and bottom send food into the blades. Even hard food like carrots or nuts are little effort. A few pulls will give you chunky nuts or salsa, while more pulls can give you a smooth puree. The bowl is just over three cups, so you can make plenty of hummus for a party, or seasoned bread crumbs for breaded cutlets for dinner. Since this doesn’t require power, you can use it outside when you’re barbecuing, or take it camping. Our writers spent three hours researching the most popular food processors on the market. 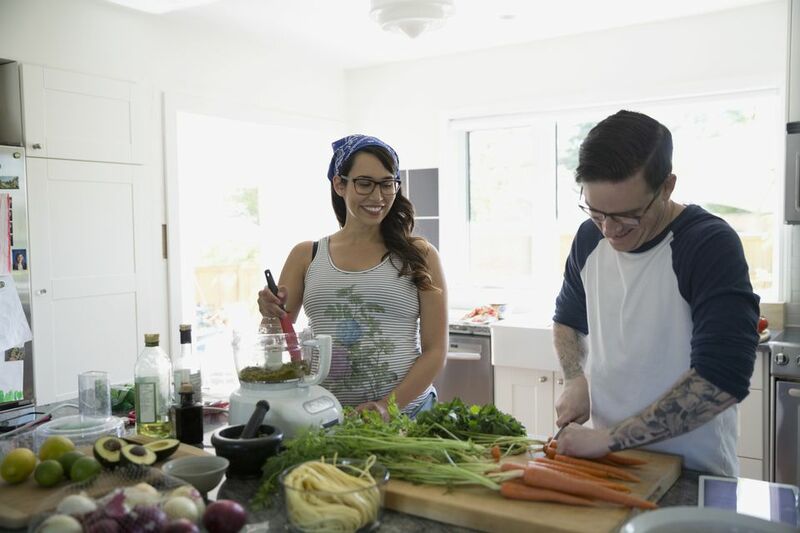 Before making their final recommendations, they considered 15 different food processors overall, screened options from 11 different brands and manufacturers, and read at least 5 user reviews (both positive and negative). All of this research adds up to recommendations you can trust. ﻿We then had our reviewers spend six hours testing one of those top-rated food processors. To really get the full experience, they set it up in their kitchens, prepped a few meals, and cleaned up. We asked them to consider the most important features when using this food processor, from its footprint to its special features. We've outlined them here so that you, too, know what to look for when shopping. Size When it comes to food processors, size really does matter. A very large food processor won’t do a great job at chopping small amounts, and emptying a small food processor repeatedly can get annoying. Some food processors solve the problem by including bowls of several sizes. Disk options It’s great to have options for different shredding and slicing sizes, but if a food processor comes with a large number of disks, you need to find a place to store them. Some food processors have reversible blades with different sizes or functions, while others have disks with adjustable cutting sizes. Do you need multiple disk options? Special features How will you use your food processor? Do you want special options, or will a basic model fit your needs? While pretty much every food processor has a chopping blade and can slice or grate using a disk, some models may have unique features like an accompanying recipe app or various color options. “This is an excellent food processor,” raved one of our testers, who used it to make pesto, prepare finely diced cilantro and onion, shred cheddar cheese, and grate parmesan cheese. In particular, our reviewers felt that it was intuitively designed, easy to use, durable, and sharp and effective. The only real downsides, according to our testers, were that it was heavy and a little bulky.